The family of the late Shirley Cathrae wish to extend their sincere thanks for the many messages of condolence and support we have received in the past few weeks. Thank you to those who sent cards, flowers, and food to our homes, and for the donations made in Shirley’s memory. We also send our gratitude and appreciation to: Dr. Wong and Nancy, and Dr. Anjum and Crystal for their excellent care and compassion; Ferguson Funeral Home staff (Kevin, Johanna, Shawn, and Melissa) for their kind and caring guidance at a very difficult time; Pastor David Young, for his comforting words; and the Meaford Agricultural Society volunteers (Verla and staff) and John (Curling Club), for the delicious lunch and donation of their time for the Celebration of Life. We are truly blessed to live in such a kind and caring community. Thank you all. 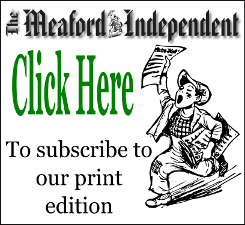 Is Meaford Being Properly Policed? A few weeks ago in your RUMOURS section you commented on recurring rumours about the lack of OPP policing in the Town of Meaford. You stated that these rumours are baseless, and that we could rest assured that we were being policed very well. I heard these rumours twice, each time from persons with intimate knowledge of the subject. In his editorial “We’re Not Perfect, But There’s No Better Place To Live Than Canada” (June 29/18) Mr. Vance seems to include amongst the things he likes about Canada is the electoral system, although he believes that Proportional Representation would be a nice improvement. In addition he likes the ability of citizens to protest and hold our governments accountable. I certainly can agree with him about the last two points, but not the first. Throughout my long life I have had to endure voting both federally and provincially under first-past-the-post, an undemocratic system that usually forms governments from a minority of electoral votes, assigning to another four year oblivion the wishes of a majority of voters.